Rent a cottage or self-catering apartment in north Yorkshire, near Aysgarth in the Yorkshire Dales for a walking break. 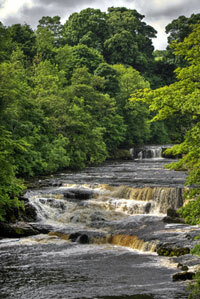 The miniscule and picturesque village of Aysgarth is a highly popular spot with walkers from all over the globe. The main reason being, that they are mesmerised by a triple set of waterfalls that have cut their way through the Dales limestone rock. The scintillating and phenomenal image of water cascading over three steps are hypnotic and words cannot describe what you see before you. When I went walking there in October 2011, it was after a massive thunderstorm, and the water was exceptionally high. My only regret is that I failed to carry a camera with me, because I thought the light was too distressing for me take a picture. However, whenever I go on a walking tour, I always like get close to any natural scenery that I come across, and on this occasion I did perch on some stone ledges to get a better view. In the summer when the water levels are low, it would be a delightful spot to sit and have some lunch before venturing out further, to an old mill, just over the bridge that is also a small museum, souvenir shop and cafe. The fitness levels required for this kind of walk need to be high, and, you must wear the right of gear, such as outerwear and walking shoes. The spray from the falls during the winter months can make walking along the falls slippery and wet, so be careful when treading. There are some intriguing things to view at the museum like a marvellous collection of horse-drawn vehicles, fire engine, a hearse and a collection of carriages. 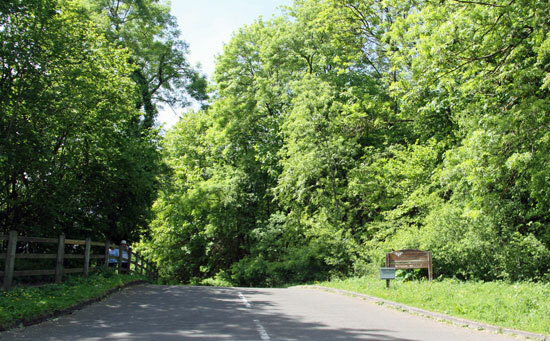 You can continue to walk up the path that has been used for century’s monks from the Jervaulx Abbey to St Andrews’s Church, which dates back as far as the 14th Century – the bell tower dates back to this era. Although, this seems like a short journey in a car, it must have taken the monks quite a long time to complete when the church was built in the 14th century. Heather Cottage is a rare and exquisite example of an Edwardian Rock Garden spanning a sixth of an acre and rising quite high at its peak, the garden has two water features, and a collection of alpines and a rich profusion of ferns. For those ecstatic walkers touring the area, Bolton Castle, from Aysgarth, is easy and makes a pleasant day tour. An fascinating point is that the castle has been in the same family for countless generations, and where Mary, Queen of Scots was held prisoner. I would advise doing this tour in two stages: the first day weather permitting walk along Aysgarth Falls and the second day spend some time exploring Bolton castle. Rent a cottage or apartment for a minimum 3 night break and make the most of your trip to the Dales. Aysgarth is well served by public transport, with buses (services 156/157) running between Northallerton and Hawes, and connecting services from Leyburn. The Dalesbus service comes through the village on Sundays and Bank Holidays during the summer. Walking is the very best way of absorbing the sights and sounds of the Yorkshire Dales. Talking the time to stare and examine the details leaves holidaymakers with wonderful memories of this beautiful northern location.